I've been reading some tutorials, and practicing the techniques that IMVU education center offers, (Sadly Max-centric,) Read some forums, and even hit up a Blender group. I haven't had any luck on my own, or finding exactly where my issue may lie through the text I read. I've been using the Female Naked Top that your Female clothing starter file offers, but I can't seem to get anything for a skin other than the MCG skin with, "Skin Composite," selected in the IMVU creator. 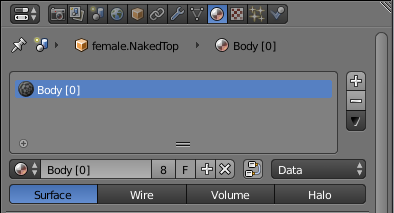 Both using the Naked Top, but I alter the object, material, and texture names to differentiate slot 0 from 7. Join both and export. Uploading under Empty Female clothing and replacing the geometries for the avatar's top. But, I just don't seem to be getting something here. Thoughts? I actually went back and figured it out on my own. I needed to derive from the female top #167. Although you figured this out can you add some images to your posts to help others understand how 'skin composite' items work when using Blender?. As you note there isn't much info out there on this particular topic so the more we can make available the better. I decided to make a simple top for my first attempt at a body mesh. Using the base avatar body is a great template, but be weary of the armpits, elbows, and shoulders when it comes to posing and clothing later. These may need to be edited if you demand better flexibility. I learned that the hard way. 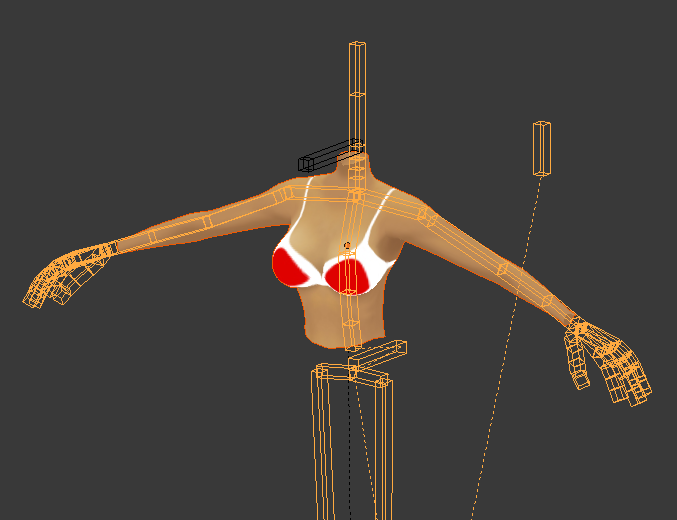 Also make sure the ends of the mesh meeting the head, hands, and pelvis remain unedited. Otherwise you can get gaps, and mismatching garments when you use your mesh with other products. I replaced the skin material on the torso/arms mesh with a body 0 material. This will be what becomes your skin composite later. Double check your UV map. One should already be provided if you are using Kat's Clothing blender file. Once it all checks out and you are happy with your body's shape select the mesh first then hold shift and select the armature rig. Make sure you are in Object mode for both rig and mesh. Export as usual. Make sure you check Selected objects under, "Main." Deselect Apply Modifiers under, "Geometries." Deselect Add Leaf Bones under, "Armatures." 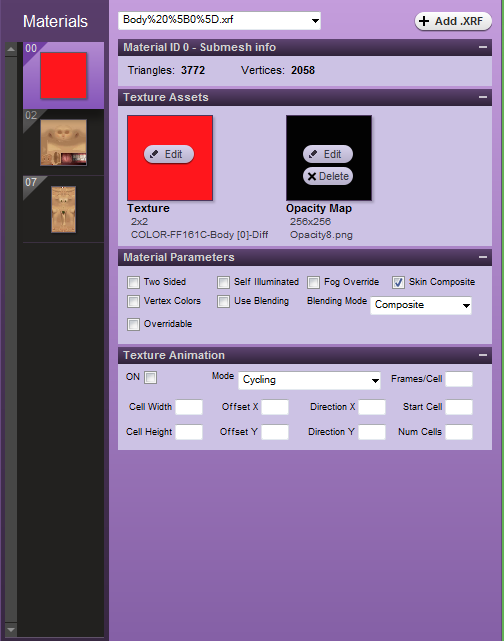 And, if you don't have any animations you desire just simply un-check the Baked Animation box under, "Animation." I open IMVU and select Derive new product. I use the top mesh 167. The Yellow Baby Tee. This Derivable Female top provides a skin template under the slot numbered seven which is what IMVU protocol utilizes when you make a skin composite. Make sure when you import your mesh that you replace the torso of the avatar, "Mesh ID 2," with your own version. Also make sure your, "Apply Scale," setting is set to .01 otherwise you will have some massive proportion issues. If you are replacing more parts than just the torso make sure to hide them using the configuration menu before you import anything to help reduce on complications during importation. Once your preparations are finished import the mesh. It should look something like this on your avatar. 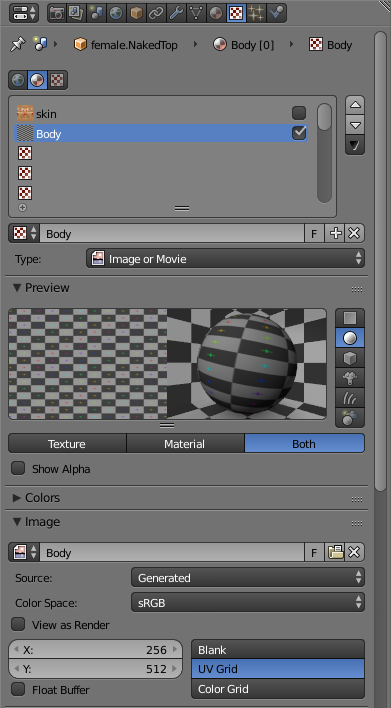 The color matches whatever you had for your diffuse color within Blender for the mesh. Lastly be sure to check the box for Skin Composite underneath the material tab matching your mesh's material number slot 0. It is extremely important you use the blackest of black opacities you can muster otherwise your diffuse color from blender will have a faint appearance over the skin composite. If everything imported correctly your end result should look something like this. Oh wow, was not expecting that much info, excellent! Questions: the difference between Skin Composites and normal clothing in a general is that the latter (clothing meshes) do not reveal the underlying avatar mesh unless it's included in the export from Blender (which then means the Users 'skin' doesn't work on those bits that are included)? 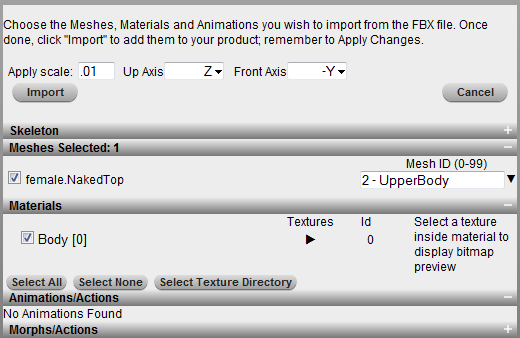 So if you wanted to create a foofy top that was transparent so the Users avatar could be seen underneath you'd mesh the top in Blender as normal, export, then once imported into IMVU, enable "Skin Composite" - with an appropriate grey-scale material mask image assigned to the mesh - to see the effect? In other words, Skin Composites are not just limited to skin-tight meshes? Clothing starter file is available here. Thank you for the compliment, Kat. And, as far as Skin Composites go. They are not simply limited to just skin tight meshes. You can make anything a Skin Composite as long as you have something under material slot 7 (Body) or Material slot 2 (Head) as a skin template. I originally tested with a circular disk floating in front of my avatar's torso. Mapped it to the skin template. It helped me understand the concept, but it sure wasn't anything pretty. 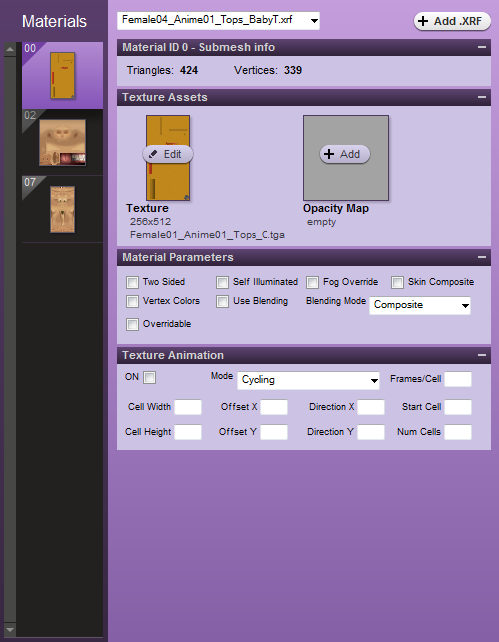 Proper mapping to the skin template is key here. You can actually take any article of clothing on IMVU and switch anything other than the skin tight layer to Skin Composite, add a black opacity, and see how funny it looks. If there isn't anything for the create mode to detect within the slots 2, 0r 7. It'll just give you a white diffusion as I have seen in the past for accessories, and for clothing they just vanish. And, to better answer your foofy top idea. You'd create the skin composite first under material slot 0, Mesh ID 2. Then once you have confirmed it works properly import your next mesh for the foofy top assigned a material slot other than 0, 7, or 2 (2 Only if you are using a head skin composite.) Assign it a Mesh ID exceeding all the ones used for the body itself, (0-9 I believe.) So let's say use slot 23 for it. Then use your gray opacity for said mesh, but instead of selecting Skin Composite for this mesh. You select Use Blending. Thanks for that additional info. Not being a clothing mesher composites have always been rather confusing, heh!